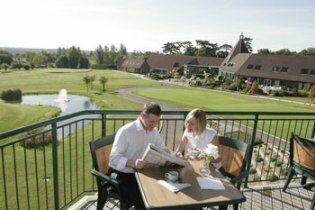 Why not take advantage of Ufford Park's Leisure Getaway Breaks for one or two nights? Prices begin at just £99 per person for a one night break, and from £130 per person for a two night break (extra nights available at a discount). Children under 15 sharing their parents' room stay free (this includes breakfast & dinner). All Leisure Getaway Breaks include dinner from the restaurant's 'house' menu, Plus full English breakfast, and use of the Health Club, gymnasium and deck-level swimming pool. 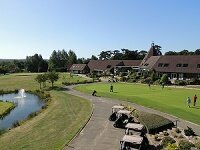 Also Ufford Park offers regular one night Golf and Spa Specials where you can enjoy either 3 hours in the luxurious Thermal Suite or 2 rounds of golf on the challenging 18 hole golf course. The Warner Cotton Coastal Resort close to Lowestoft is set on a cliff overlooking the sparkling North Sea, and offers adult chalet accommodation on a half-board basis (two meals are included). 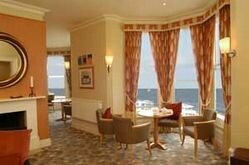 The rooms are cosy and tastefully decorated, and come with breath-taking views (pictured below). There are usually some cracking short break deals at Kesgrave Hall boutique luxury hotel in Ipswich (bar pictured above). This comfortable and casual Hotel has 23 modern bedrooms, each with en suites and available at various levels from standard to principal. 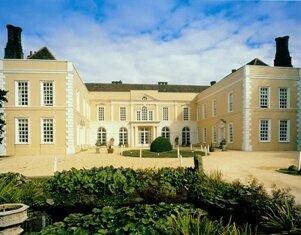 Check out their current short break offers here - Kesgrave Hall . If the countryside is more your thing but you'd like to play golf too, then just outside Ipswich is the very special Hintlesham Hall Hotel. Standing in 175 acres of beautiful Suffolk countryside next to an 18 hole golf course, this Grade 1 listed Elizabethan Manor House offers stunning, recently renovated bedrooms, a first class restaurant along with a newly equipped gymnasium and a beauty salon.